Drunk driving charges are ones that cut across racial, ethnic, gender and income distinctions. Practically anyone who is driving a motor vehicle in Nevada could be pulled over on suspicion of DUI if an officer thinks it is justified. Depending on the circumstances, only a couple of drinks consumed in a short period of time could put you over the legal limit. If you are arrested on suspicion of drunk driving, the first call you make should be to an experienced DUI criminal defense attorney. 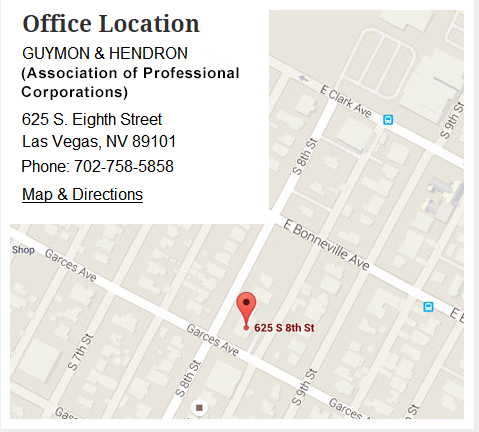 The lawyers at Guymon & Hendron have extensive experience handling drunk driving cases for clients in Nevada.Whether this is your first DUI charge or if you have been charged multiple times with DUI call Guymon & Hendron Law now we can Help you. Being convicted of drunk driving has both immediate and long-term consequences. In the short term, you may have to spend time in jail or perform community service; you could lose your driver’s license and the ability to drive; or you might have to install an ignition interlock device in your vehicle, which would require you to demonstrate that you are sober before your vehicle would start. In the long term, your conviction will stay on your record indefinitely. It could also appear on your driver history for 10 years. Contact Guymon & Hendron if you are in immediate need of a drunk driving defense attorney or if you want to schedule a consultation about your case. Call us at 702-758-5858 or complete and submit our online contact form.